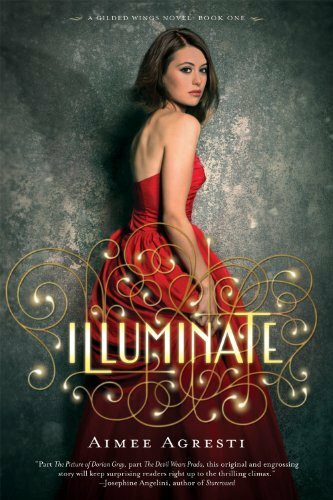 The Compulsive Reader: Looking Ahead: Aimee Agresti and Illuminate! 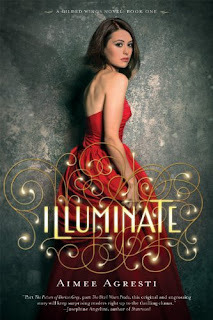 Today I have Aimee Agresti and her book, Illuminate! I was lucky enough to snag this one at GLIBA, and it is a gorgeous book! AA: Yikes, ten words, that's tough! OK, how about this, it sounds like a fun newspaper headline: Teen angel battles devils, saves souls and falls in love. AA: I think it's that I've been so very well cared for. The folks at Houghton Mifflin Harcourt have been so wonderful and enthusiastic. I have an incredible editor, who I adore, and who has such a sharp eye. I've learned a lot from her. And everyone I've worked with from the publicist to the cover designer to the copy editor has had such genuinely kind words about the book. That's meant a lot, especially to a first-timer like me. These are all people who have a lot of books to work on and the fact that they're giving their all to mine is something I appreciate so much and don't take for granted. It also helps that I happen to have a fantastic agent who keeps involved every step of the way and is a real friend. What can I say? I'm a lucky girl! TCR: What was your reaction when you saw your cover? AA: My reaction was: WOW!!!!!!!! I absolutely LOVED it. I mean, look at that thing, it's just gorgeous! It really embodies the feeling of glamour in the book and then I just love that wing in shadow behind her. It's a really special touch that captures the idea that Haven has to work to earn her wings and isn't a full-fledged angel just yet. It's just a great image. And the cover model is beautiful, her expression says so much: she's somehow able to perfectly convey Haven's soulful vulnerability. I just love it. As soon as I saw it, I told the brilliant cover designer, Liz Tardiff, that I hope this book will, indeed, be judged by its cover! AA: My website aimeeagresti.com is the place to go for news and updates. Stay tuned: I'll be posting fun things like an ILLUMINATE playlist and soon I'll be doing my first giveaway! Thanks so much, Aimee! To learn more about Aimee's book, visit her website, or read on! "Haven Terra is a brainy, shy high school outcast. But everything changes when she isawarded a prestigious internship at a posh Chicago hotel under the watchful eyes of a group of gorgeous strangers: the powerful and alluring hotel owner Aurelia Brown; her second-in-command, the dashing Lucian Grove; and their stunning but aloof staff of glamazons called The Outfit. This one will be available on March 6th, 2012! I like Aimee's explanation about the cover. Covers with a deeper meaning in all the details makes me want to read the books all the more! This sounds amazing! I want to read it now. The cover is gorgeous but actually the summary interested me even more.